Keep track of your car’s gas milege. Enter details of each fill up and Fuel-O-Meter will display the consumption since last the fill up, over all consumption and cost per km. It also displays a graph showing you milage over time. You are supposed to be able to change the units from kilometers/liters to miles/gallon but I couuldn’t get the setting change to “stick”. 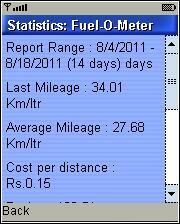 The app also displays cost as rupees/km with no way to change to dollars. But the units don’t really matter, as if you enter gallons and dollars what ever it shows as km/liter and km/rs. is actually miles/gallon and miles/$. Boost CDMA Compatible: (tested on Motorola Rambler): Yes. The app “Fuel-O-Meter” (16 KB) is ready to download or send to your phone as filename:”FuelOMeter”. I have this on my BB8530 and have added 3 entries so far with no problems. I’ll be adding a 4th today or tomorrow and will post back if it doesn’t work. i just tried to add a 3rd record on my i465 and i get a empty black screen.